It's giveaway day! Yay! Thanks for stopping by at Canoe Ridge Creations. I have been wanting to do a giveaway for a while now, and what better time than for Sew, Mama, Sew's Giveaway Day! 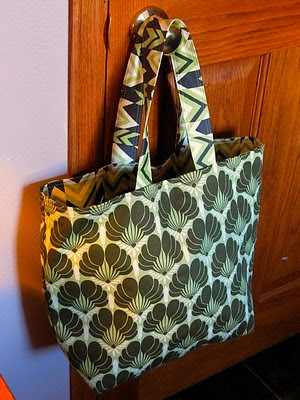 It is a Go Green Shopping Bag! 1.) 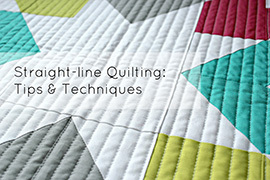 Leave a comment telling me what your favorite part about sewing/quilting is. 2.) 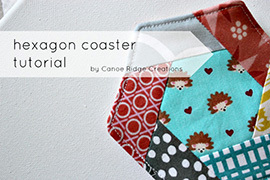 Become a follower of Canoe Ridge Creations blog, or tell me if you already are. Pretty simple, don't you think? :) The giveaway will be open until December 17th at midnight EST. The lucky winner will be chosen at random and announced on December 18th. (Sorry, but the giveaway is only open to people within the United States) So check back then and good luck! Now that is one gorgeous bag! The fabric is outstanding! I love many things about quilting but I think the best is the friends I have made. I love it! :) My favorite thing about sewing is when I get to see the finished product that I made!!! I love going to my room and letting my mind wander....while also being productive. It's so relaxing, I can only imagine how crazy I would be if I didn't have this outlet! I've added you to my blog list....couldn't get the follower tab to show but you're on my aggregator! I'd have to say my favorite part is the finished product! I do pretty simple sewing, so the project comes together quickly. Right now my favorite part of sewing and quilting is finishing. :D Feel like I had so many UFOs, that I'm really loving the sense of accomplishment as I finish them up and wrap them as gifts. My favorite part about sewing/quilting is picking out the fabrics--always so many possibilities and so much potential! (which is why I have way to much fabric) I also like seeing the finished project--such a sense of accomplishment. Great bag! My favorite part of sewing is the creating part. I love coming up with new things to make! Beautiful bag! My favorite part of sewing is seeing the finished product! For quilting...I actually like picking out fabrics & rotary cutting the most. Weird, I know. My favorite part is giving it to someone who will love it! My favorite part of sewing is piecing different blocks. (hence my blog name) Thanks for a chance to win. Cute! I don't sew, but I love spinning. It's very relaxing. my favorite part is starting with so many pieces and ending up with a beautiful end product! I love having something that stays done. Everything else in my life has to be redone in hours or days--cooking, cleaning laundry, etc, but a quilt stays done and I love it! I love finishing a project! Thanks for the chance!! Oooh, I want it! Thanks for a great giveaway! My favorite thing about sewing is the final outcome, it's so rewarding! my favorite part of sewing is looking at my beautiful finished product! Wow, that's a lovely bag! I love the print! What a lovely bag! Thanks for the chance to win! My favorite thing about sewing is the end result...I just love working on a quilt and seeing it come together and how it all looks at the end! I'm a new follower - you have a great blog!! There are lots of things i enjoy about sewing and quilting like being creative and making something unique, but mostly i enjoy sewing together with my family! Ok, im now a follower too. I too am from Iowa and started sewing when I was pretty young from my Mom. you sound like you were possibly a 4-H'er too?? My fave part is creating my own patterns and watching the results "grow"! my favorite thing about sewing is the satisfaction I get from looking at the finished product and knowing I did that. My favorite part about sewing is the reward of the completed product! Something you made all on your own that you can show off to all your friends. My favorite part about quilting it knowing that I am the only person in the world with this thing. 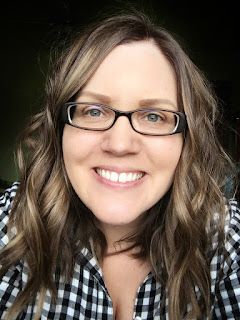 My favorite part of sewing is thinking of who I am making the item for, and my second favorite thing is finding a fun tutorial or pattern to follow from the blogging world! What a great bag! My favorite part of sewing is the sense of accomplishment when I've made something myself. My favorite part about sewing is all the beutiful fabrics. Thank you for the chance to win! 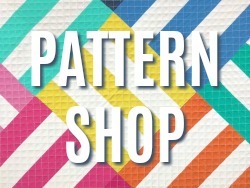 How to pick a favorite part of sewing . . . ? I love the process (except sometimes for all the cutting! ), but I mostly love making something useful or beautiful out of something that was neither before that. I like for the things I make to be used and it is totally gratifying to see something I made (especially for a child) be loved and cherished. I made my niece a stuffed dog when she was born and she still sleeps with him every night (she's now 5!) Best.Feeling.Ever. My favorite thing about sewing is playing with new fabric & color combinations! I love picking out the fabrics and color combinations! It lets me create exactly what I want and not have to settle for the 2 or 3 options I'd get at a store. I love sewing and creating something new with fabric and fit that I want. My favorite part about quilting is picking the fabric! Sewing for me is just a means to justifying more fabric in the collection. I adore this leafy print on the bag, thanks for hosting a great giveaway. Also, yay for a fellow 23yr old crafter! Thanks for doing a giveaway! I love quilting because I feel like it's my creative outlet. I love putting on the music and just getting lost in the work. This is a beautiful bag. I love the stunning fabric! I love to sew with beautiful fabrics, but since I think they're precious, I try to find ways to mix little pieces of designer fabrics with thrifted solids. :D So fun! 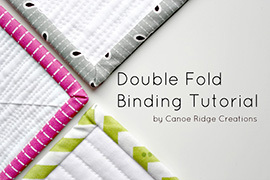 my favorite part about quilting and sewing is having something come together under my hands- such an accomplishment! love the feeling! Very nice bag! My favorite part of sewing and quilting is the sense of satisfaction of making some pretty and usable! Love it! I also enjoy the thinking time while sewing...some of the best times to just think things over is when I'm working on projects. My favorite part is shopping for fabric and imagining what I am going to make. The actually making is far more difficult. figuring it out as I generally am not using a pattern. Then putting the pieces together. I love planning the project. What a great bag! My birthday is the 17th, and winning would make the day extra-special! My favorite part about sewing is holding the finished project in my hands or giving them to someone else! my favorite part about sewing is just feeling the fabric - I know that sounds silly but it is so soothing to feel fabric run between your fingers. My favorite part about needlework is seeing the finished product too, but it also calms me down to work on different projects. my favorite part of sewing is the planning. unless i'm hand sewing and then it's the actual hand sewing part. it's a lovely bag you are offering, thank you. cheers! I love having the skills to make a pile of fabric, or a ripped garment, or a bunch of discarded would-be trash into something useful and beautiful. My favorite part about sewing/quilting? That's easy. I love shopping for the fabric. I love touching the fabric. Amazing! Hmmmmm......favorite part.....i like picking out the fabric but i think its just making something fun and useful. Therapy. Very nice bag! My favorite part of sewing/quilting is deciding what I'm going to make. That is such a pretty bag. Please include me in the giveaway. My favorite part of sewing these days is trying to push myself out of my comfort zone and experiment, no matter the outcome. My favorite part of sewing is the hand-finishing. I find it a very soothing way to wrap up a project. I've been sewing for a few years now but I still get a little surprised thrill every time something comes out looking like it's supposed to! Seeing the end product is my favorite part! and... I love "green" shopping bags. I'm making one right now! My favorite part is seeing things take shape and being transformed from flat pieces of fabric to something beautiful, and 3D in the case of sewing. Mu favorite part of sewing is creating something that is one of a kind. For clothing, I am greatful that I can sew clothing that fits my family! My favorite thing about sew is a very abstract thought. I really love stitches. I love to watch as the item comes together with a a single strand of thread but with many stitches. I'm a beginner and I often make mistakes. So right now my favorite part of sewing is seeing that in the end despite my mishaps, it still looks great. My favorite part is seeing something come out of nothing pretty much. My favorite part of sewing is enjoying my finished creation! My favorite part about hand quilting is how meditative it is. I can let my mind wander, and just relax. Everything narrows down to just the needed and thread, and I stop worrying about everything else. Great bag! I'm a new follower (Google Reader)! My favorite part, aside from finishing, is selecting the fabric combination. Thanks! Beautiful bag! I think my favorite part of sewing/quilting is shopping for fabric! I have two favorite parts - the planning and the finishing! Oh and I like the executing too. I guess I like it all! 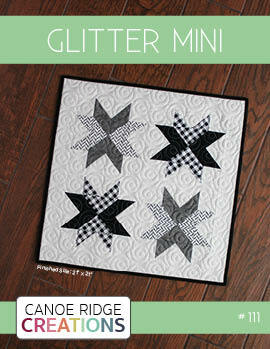 I love the combination of creativity and utility that you get with sewing and quilting. 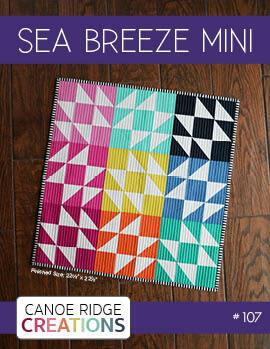 I love the fabrics and how you can find something for everyone! It is a fun and useful hobby and I don't feel like I am wasting time with it! Thanks for a great giveaway! i love seeing my kids wear or play with things i've made. even better if they love them! My favorite part of sewing is choosing fabric, especially when there are more than one involved. My favorite part about sewing is using the finished project! Thank you so much for the giveaway. I am new to sewing. What I really like so far, is picking the fabrics. All of those great colors and patterns are just waiting to become something special. Favorite part of sewing is challenging myself to think 3 dimensionally and then watching a piece unfold. I love a good challenge! My favorite part about sewing is creating something useful out of just a flat piece of fabric. I love being able to create something totally original! My favorite part of sewing is the end result! oh i love this bag! my favorite part is just seeing how each small step brings me closer to a polished, finished product! it's pretty magical. i am a new blog follower, looking forward to reading you! What a beautiful bag! I love the fabric and pattern. Thanks so much for the giveaway. My favorite part is choosing fabrics and choosing a pattern or designing he quilt. It truly is all about he beautiful fabrics for me! beautiful bag... best part if picking fabric, also the hardest! I actually love sketching stuff out and piecing/sewing together quilt squares. My attention span for a single project is...rather short, so I tend to do part of a project and then start something else. Thanks for the giveaway! What a fantastic bag! :) My favorite part of sewing is being able to create something completely unique! Thank you for the chance to win! 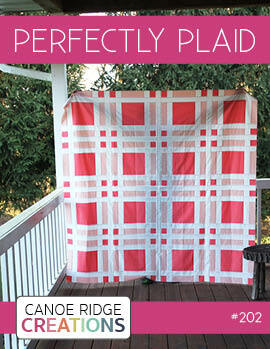 I love piecing the top and seeing the fabrics lock together to form something beautiful! my favorite part is putting together fabrics (even ones that seem a bit wrong for one another) and seeing the beautiful final product! My favorite part of quilting is all the fabulous fabric! Thanks for the great giveaway! I have a couple favorite parts... my utmost favorite is buying fabric. It's addicting ;) and then my second favorite part is dreaming up designs and color combos in my head. I'm a daydreamer! It's a beautiful bag! My favorite part of sewing is making something unique and just to my taste, something I couldn't find in a shop. Thank you for the giveaway! My favorite part about sewing and quilting is giving the things I make away. I love the process of creating something, knowing exactly who it's going to go to, and surprising the person with a one of a kind gift. I like finishing! Thanks for the chance. the bag is beautiful, thanks for the chance to enter! I think my favorite part of sewing/crafting is when I am right in the thick of it - putting things together - and I really lose myself in it! I love the fabric you chose for the bag. Thanks for the chance to win. I received a sewing machine last Christmas but I've been chronically ill this year. so I haven't learned how to use it. But I like the idea of limitless possibilities in creating that sewing offers. AHHH, I can't just pick one favorite!! One thing I LOVE is how happy it makes my youngest daughter when she gets a new dress I made! Love that! I just added you to my blogreader. I like seeing all of your sewing projects (and knitting too!) and like your fabric choices. I love choosing the fabrics (buying them too- LOL. trying to get the colors & values just right is great fun. Nice tote - mine are all falling apart - thanks for the chance. 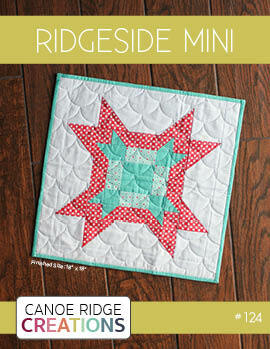 I love quilting because it gives me a creative outlet and a definite stress reliever from my day job! My favorite part is choosing fabrics. Thanks for the giveaway! Love the fabric on the bag! Thanks for sharing the great giveaway! I love to hand sew binding! Favorite part of sewing is the completed project!! My favorite part of quilting is seeing an idea come together. My ideas don't always come out like i'd hoped, but I always learn something! Great bag! Thank you. My favorite thing is seeing the finished project and knowing that I designed that and I made it. There are not too many feelings similar to that. I like the process of sewing... learning new techniques and figuring out how all the angles work together. I generally don't enjoy my own finished products, but I definitely enjoy others! I love seeing a finished product and saying, "dude, I made that!" seeing the finished product, showing it off and imagining myself using it is was motivates me! My favorite part is topstitching. What a lovely bag - nice work! Beautiful giveaway! I love the thrill of starting a project and making my first cut into the project fabric. Lovely! My favorite part? Picking out the loose threads at the end! I love seeing someone using a gift I made them! I love teaching others how to sew. Children, adults... It's so great to share our passion with others! lovely bag! my favorite part of sewing is working with beautiful fabrics. Gorgeous bag! Thanks for the chance to win. My favorite part of sewing? Actually I have two. The first is searching for and buying new fabrics. It's addicting. Second is the moment when I finish a project. It always feels so good to see the finished product! My favorite part of quilting is seeing how the fabric colors go together. It is fun to change one out and see a whole different quilt. thanks for the chance to win. my favorite part of sewing is right before I finish a project- seeing the work finally come together! Beautiful bag! I love picking fabrics when sewing and of course the finished product! Thanks for the chance! Beautiful bag - it looks like it would fit my shoulder perfectly... hint, hint! 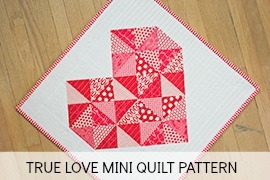 I love quilting which is a big part of sewing. Thanks for the chance! I love when one of my projects hits the phase of coming together - both the feeling of accomplishment and relief! (I'm a self-taught beginner.) This bag is just lovely, both design and fabric. Thanks for the chance to win. And I just became a follower!! My favortie part of sewing the freedom to create and make something your own. Even working from a pattern, you can make changes to make your item unique. I am loving learning a new skill. I am just a newbie to sewing. Love this shopping bag! My favorite part of sewing is when someone compliments something I get to tell them that I MADE IT! Such a great feeling. What a beautiful bag!!! ....thanks for the chance to win. I love learning a new skill and accomplishing something now. This is crazy, but I love how the sewing machine sounds when it is stitching! I love learning new skills in sewing. I feel a sense of accomplishment after I tackle a daunting project and complete it. Wow, beautiful bag! Thanks for the chance to win it! I love piecing together quilt tops. I have lots of them ready and waiting to be basted and quilted. I just can't seem to get to them, I just keep making tops! Using my seam ripper. Hahaha...seriously, putting beautiful fabrics together. I'm a new follower - happy holidays! My favorite part of sewing is finishing! I love the end result! My favorite part about sewing is the fact that it just draws me in. It has such a soothing affect on me because my boys know that when I'm at my sewing machine, they pretty much don't bug me. Gives me some quiet moments. Great looking bag and cute blog! My favorite part is finishing a project. My favorite part of sewing is when it all comes together and turns out the way I had envisioned it. Thanks for the chance to win! I love the finished product :) Such a reward for all of the hard work, don't cha think? Haha! Thanks for this great giveaway! Merry Christmas! I love sewing but when I am finished and see what all the hard work and time produced- yay, I get so excited. My favorite part of quilting is chain piecing--there's just something methodical about it that suits me! A ha! I knew something about you seemed familiar--I subscribe to GenX and that's where I saw your bag. Awesome! I'm going to sign up to follow right now! I haven't sewn in over 20 years (making clothes big things etc) I still do hand sewing, but my machine is dead...I am supposed to get one after the holidays. BUT...when I sewed regularly, I loved that I could pick the style with the fabric, and not rely on what was in the store. I also like that once I get a new machine, I'll be able to use it in my mixed media art and paper crafts as well. This is a lovely bag! Nice job. just became a follower and saw your tutorial for this bag, i so want to try it. My favorite part of sewing / quilting is the quiet time spent in the sewing room, my dogs always join me in there too!